A good many pieces of wood tourists buy as Makonde carvings are far from the carvings of the Makonde. This may be true of what most tourists buy in many parts of the world. The tourist has proved to be a source of income to nations as well as individuals. He has the money and urge to take away something that will remind him of the people and their culture; so the people give it to him, but, in the process, and because they want to get as much money out of him as possible, what is given becomes less and less authentic. In the sixties the majority of Makonde carvers found in Dar es Salaam today lived in a small Makonde settlement called Boko some thirty two kilometres along the Bagamoyo road. The seventies saw a move by the Makonde to get closer to the buyer until by the late seventies Boko village was left as a farming area. This was also the beginning of the disintegration of the Makonde Society there. Like other African ethnic groups, the Makonde have their own cobweb of a heritage of ritual, taboos and superstition. They have their own way of seeing and relating to ‘godness’ and their own systems of keeping at peace with this godness. During one weekend in 1967 I was witness at Boko village to a ritual that started on a Friday afternoon and ran through to Sunday evening. It was a ‘coming of age’ rite for a girl. After greetings, salutations and ululation, drums started to get tuned. It was the beginning of a fifty hours long ritual, There were high toned drums accompanied by something of a talking drum; males with heavily tattoed faces and torsoes; females with tatooed faces and lip plugs; high resonant female voices combined to make an intricate base for the “Sindimba’ dance. At one stage the circle of dancers was joined by two masked dancers. The dance and rhythm flowed and stopped in a manner rather distracting to a learner but meaningful to the Makonde. The staccato movements of the masked dancers which are otherwise very comic made the core of the function. While there is very close communication between the musicians and dancers, there is also some communication with the audience far and beyond that which exists with strangers watching. Hence the success or failure of the function. The girl whose day this was, was locked up in the house and brought out only briefly for a glimpse by future suitors. The combination of drum music, masked dancers, heavily tattoed males and the unusually exotic hip movements of the women, merged to give a taste of something of the mystique understandable only to them. 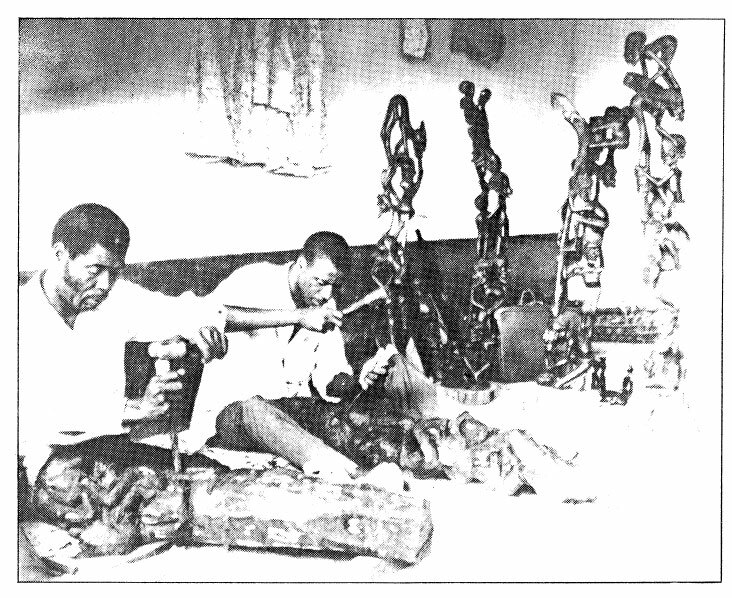 The mystical air, indeed, this esoteric web of rites is the source of and inspiration behind the Makonde carver. On the other hand the carving is part and parcel of this web. It is, as it were, a symbolisation of the mystique referred to earlier. This carving was never made for sale. The carver kept it as one would keep the shirt of a deceased father. It was a link between him and, say, the supernatural. It was like a charm on the one hand and an effigy on the other. The name “shetani” which has come to be used to describe the abstract carvings does not mean “satan” as it is generally understood. The name should not be tinted with any “evil” connotations either. It is the best the Makonde have done and can do to explain “the mystique”. Outside this aura of ritual, the Makonde, as an artist, and like any artist from any other culture, has nature and his own socio-economic surroundings to provide inspiration and reaction to his art. One Vitorino Antony Madonga, a reputed carver, directed my attention to the clouds when I was trying to find his source of inspiration. Clouds, he said, are always full of pictures. One can actually see a total picture there and all one has to do is to copy it and transform it into a carving. At times the cloud pictures tend to compliment something or some event that is taking place down on earth. The carver tries to incorporate this cloud-earth relationship into his carving. Carvings derived from this inspiration are called “mawingu” (clouds). But the carver says there are so many aspects of our lives, our spirits and our true nature and identity as animals which are very cloudy. What the artist does is try to represent the frightening and rather ugly nature of that which is not understandable and dark about man. To Mr. Madonga, the tattoo designs on their faces and bodies have a particular meaning. Some of the body tattoos stand for clan totems. These are at times reproduced in yet more abstract form in the carvings. The true Makonde carving is therefore an embodiment of the austerity of life not represented in many of the so-called Makonde carvings bought today.